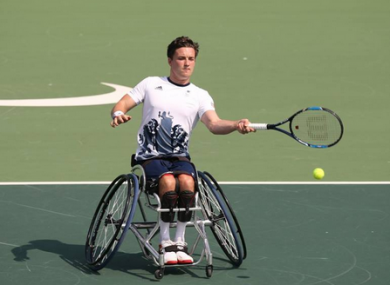 Gordon Reid is hoping to win Paralympic gold this week, but by showcasing his talents he’s transcending the sport of wheelchair tennis. Reid in action in Rio yesterday. TO THOSE WHOSE tennis interest peaks and troughs around a certain time of the year, the name Gordon Reid may ring a bell. His journey to Wimbledon glory during the summer captured the imagination and brought a whole new audience to wheelchair tennis. The Scot followed in the footsteps of Andy Murray by winning at SW19 in July and in the process etched his name in the history books. By beating Sweden’s Stefan Olsson in the final, he became the first ever men’s singles wheelchair champion at Wimbledon. On Monday morning, the 24-year-old breezed through his third round assignment here at the Paralympic Games to move one step closer to replicating the achievement of his compatriot in Rio. It would cap the most remarkable season for Reid, who had already won the Australian Open in January prior to his groundbreaking win at Wimbledon. A decade after losing the use of his legs, he is now considered a pioneer of the sport, transcending the game and showcasing it worldwide — something he has always felt a responsibility to do. To encourage others to do the same, to inspire those who have had their world turned upside down and to set an example to those battling with their own disability. Whether on TV or at the stadium, a couple of minutes watching Reid — and any wheelchair tennis players for that matter — is awe-inspiring; try coming away from it and not hold a new-found respect and admiration for these athletes. The ease in which he gets around the court, the power he generates from such a low angle and the sheer athleticism of the man is beyond belief. Pivoting and pirouetting, Reid, and all of the wheelchair athletes at these Games, are changing the perception of what is possible on two wheels. “I have not only wanted to win matches but wanted to try and put on a showcase of our sport, provide a spectacle,” he says. “I put too much pressure on myself and it wasn’t working. “What I have done this whole year in the Grand Slams and here so far is to just try and enjoy it, enjoy the moment, let the tennis happen. So far I have shown what quality there is in wheelchair tennis. And Reid isn’t just doing this on his own. Under the searing heat of the Rio mercury, a group of Great Britain supporters are perched on the far side of the Olympic Tennis Centre. The rest of the crowd have flocked under the shaded area to shelter from the sun, but Reid’s army of travelling supporters stay put. ‘Reido, Reido,’ they regularly chant. Two of them, Gary Peak and Graeme Ross, have been with him every step of the way. At the age of 13, Reid contracted Transverse Myelitis — a disease affecting the spinal cord. One night, his legs just gave way and his life had changed forever. He credits his friends, and tennis, for keeping him going. He found comfort in the sport and found motivation in showing people what can be done regardless of the hand you’re dealt. “I was in hospital for six months,” he recalls. “I couldn’t feel my legs – I had friends and family around me crying and upset. Over the course of his 30-minute demolition of France’s Frederic Cattaneo yesterday, there was more than enough evidence to recognise Reid’s innate talent. As a child prodigy, he had shown great promise as a tennis player up until a week before his 13th birthday. Fate wasn’t going to stop him, however. When he unfurls his full repertoire of shots, you can see why he is the current holder of two Grand Slam titles. His touch, athletic ability, one-handed backhand, deft net play and potent serve make him one of the best. A month after his friend and fellow Scotsman Murray defended his Olympic crown in this stadium, Reid wants to follow suit and add another title to his CV. “The Paralympics is right up there,” he said. “It is something that we only get to do once every four years. When you are part of a bigger team, representing your country, it is a real special honour that we don’t have at the Grand Slams. While Reid, at this stage of his fledgling career, is in pursuit of titles, there’s more to it than that. Every time he steps onto the court he is on a mission to further his sport and prove that, with a disability or not, you can still pursue, and achieve, your childhood dreams. Email “Setting the wheels in motion: Wimbledon champion's tale of triumph over adversity ”. Feedback on “Setting the wheels in motion: Wimbledon champion's tale of triumph over adversity ”.